Or, how an app can help your students come up with a thesis statement. Learning how to make concise, insightful statements about difficult ideas remains one of the cornerstones of a college education. Perhaps more than anything else, processing and articulating difficult concepts as a way to start building new creative insights of one’s own is the point of higher education. Which is why I sometimes ask my undergraduate STS class to use a comic-book-making app. Let me explain. 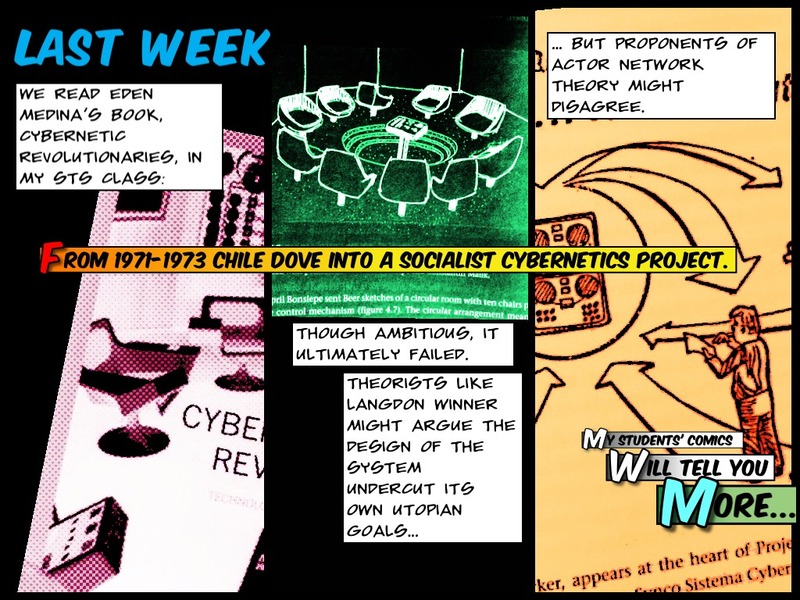 One week the class read Eden Medina’s award-winning book, Cybernetic Revolutionaries. As with any interesting work, Medina’s contains difficult concepts and slippery ideas. Articulating these ideas is crucial to fully understanding them, but sometimes as we discuss books in class overly-verbose articulation slips into narrative and endless example. While narrative and example are useful tools with which to think, they are a means to the end of understanding, a way of getting to the kernel of insight that one eventually hopes to highlight. That’s where the comics come in. We had the class discussion (all 2+ hours of it), and then it was time to nail down the kernels of insight, stating them as compellingly and concisely as possible. In order to facilitate this, I asked students to use a comic-making app for their IIT-issued iPads. Their goal was to make a “one page” comic that crystallized a point of their choosing from Cybernetic Revolutionaries. In particular, I asked them to keep in mind how the STS theorists we read so far (Winner, Latour, Pinch, Kline, and Balabanian) might be brought to bear on the text to create or clarify their main insight. Click here to see the students’ comics.